Maes-y-Delyn: What a 'buzz'y week! There has been a real 'buzz' of activity here over the last few weeks (it must be spring). And a large part of that activity could be attributed to this year’s addition of our bee hive; as they fruit trees and veggies have flourished. 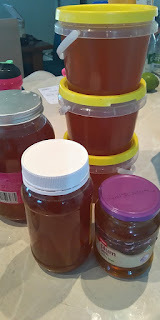 Other than selecting a position for our hive (preparing and providing some much required TLC to the previously loved hive and then purchasing our ‘brood’ from a local honey supplier the bees have pretty much been left to their own devices for the past six months. I had (on occasion) made an attempt to 'check in'; in other words, suited up I took a look at their progress in the hive... which did result in my being stung! Note to self: running tights do not make appropriate apiarist attire! Although to be fair in general they have been mostly placid. The hive is situated at the furthest point of the house yard, close to the pig pen. This allows for ease of maintenance (mowing, trimming grass etc). and the bees are situated near trees and water. Apiarist is a beekeeper; an apiary refers to the location of hives. A hive refers to the structure or nest occupied by a colony of bees. So hive is the housing and a colony refers to the bees who occupy it as a group, including their ranks/functions. Hives may take a number of forms from wild or native hives (so ones wild colonies construct themselves) to artificial hives that house domesticated bees. With domesticated bees, the internal structure consists of beeswax cells called honeycomb. These maybe artificial or formed within frames with or without a foundation. The honeycomb is used by bees to store food sources (honey and pollen) and their “brood” (their eggs and larvae). 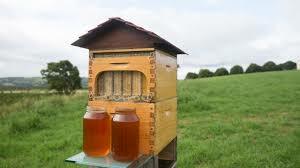 The methods used to host the bees and therefore harvest the honey really does depend upon the type of hive used. The Langstroth hive is a modular system consisting of boxes filled with frames. To begin with he supplied a local honey producer with a box filled with ‘prepped’ frames. These frames have wire that permeates through them which can be heated to melt/attach a wax foundation upon which the bees will (hopefully) build and fill their honeycomb. In this instance we are hoping for the contents to be a strong “brood” (larvae). Once this box contained a quantity of honeycomb, larvae and young bees the supplier then contacted us to retrieve our box. This then formed our “nucleus”- brood, young bees and importantly our own queen. This nucleus would allow us to form our own colony. 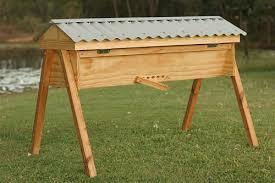 The advantage of the Langstroth hive is that it is modular and the form and parts are common and easily sourced. So as with sourcing our “nucleus” they are easy to transfer or “split”. However these are not the only types of hives. Many prefer the 'top bar', the benefits include; Lighter to work with and ease of use- by switching the set up from a vertical plane to horizontal the honey then becomes front of the hive and brood/nest at the back. This arrangement should be less disruptive to the bees and therefore many claim they do not require smoke or bee suits to inspect. Making this type of hive increasingly popular with backyard bee keepers/producers, as it is accessible to all ages and physical ability levels- Langstorth boxes get rather heavy when full, so this horizontal format reduces/eliminates the need to lift. This method is also commonly homemade, with a number of instructions/ plans etc available online (with a little research), therefore this may be the most cost effective for the beginner, starting out. Any also prefer this method as it is deemed 'more natural'; the bees construct their own honeycomb structure, also allowing for the honey comb to be utilised. This does however mean that improperly formed combs can break off and a greater level of attention and potential intervention is required. Some also experience issues with ventilation and heat retention over winters (not too much of an issue in the tropics). 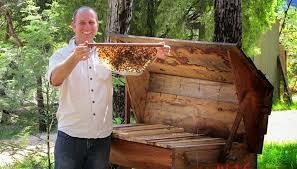 Another increasingly popular hive here in Australia is the 'Flow hive'. This is a newcomer to the market being developed by an Australian family, who became one of the world most successful crowdfunding campaigns. Launching their patented idea on Indiegogo in February 2015. This product is adaptable to other hive setups (particularly the Langstroth) and for the lowest box is primarily the same. But the honey box comprises of two moulded sections creating a honey comb form. These are then moved (using a key) to split the form, draining the honey content. The idea being there is less disruption to the colony when extracting honey, less equipment and time required, and (according to their website, and the prompt to develop this method) fewer bee injuries/ squashed during the process. I personally cannot comment on this as I don't know of anyone who has one, or seen one in action (though I am curious). Downside is the initial purchase is more pricey; although this should be offset by the need for equipment and time for extracting honey- hot knives, honey extractor/spinner, filtering equipment etc. ubs’ that feed on honey, pollen and nectar to pupal (bee young), before becoming adults that perform specialist tasks. Queens are the only members of a colony able to lay fertilised eggs. Workers bees are the largest population within a colony and are entirely female, but they are unable to produce fertilized eggs. 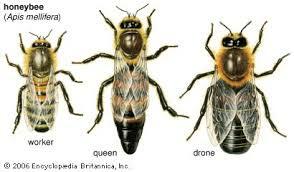 If there is no queen they may lay ‘unfertilized eggs’, which become male drones. Workers forage for pollen tend to all other bees and larvae, ventilate the hive and defend the nest. The average life span of worker bees is approximately six weeks. Drones are male and have only one task: to fertilize new queens. Swarms are a natural part of colony behaviour, and are generally the result of overcrowding within the existing hive and/or the presence of multiple queens. In which case the older queens will leave with approximately half of the hive’s worker bees, leaving the new queen in the hive with the rest of the workers. Whilst swarming is a natural cycle for bees, in domesticated bees most bee keepers attempt to prevent this occurring through “splitting” hives. One of the most misunderstood things I found out from keeping bees, is that whilst swarming honey bees are generally at their most docile; as they do not have young or a nest to defend and as such, their incentive to sting is reduced. Although they will still attack if provoked, as they still have a queen to defend. In the open a ‘swarm’ maybe encouraged into an artificial hive; as they are actively seeking a new home. This is a cost effective means to obtaining a colony given you know what you are doing. Often mistaken for ‘swarms’ are wild hives that may have been constructed in hollow trees, building cavities etc. These are far more difficult (if not impossible) to remove and may require pest management to assist. So that’s the basics as I understand it. So over the past six months our ‘nucleus’ has been allowed to develop into its own colony within the two box (high) hive. Sometimes I have heard these ‘boxes’ or layers referred to as ‘super’. Once there was evidence of the “brood” (formation, larvae etc.) in half of the frames of the second box we placed a third on top; separated by a “queen excluder”. This should allow for our colony to continue to grow, whilst the plastic barrier allows the rest of the colony to enter the upper most box, but no the queen. This is what is referred to as a “honey super”. Therefore the colony can build honeycomb and honey, but there should not be any fertilised eggs (as the queen is unable to get in there). This allows the queen and larvae to feed from and inhabit the lower box/es, leaving us harvest from the highest box; safe in the knowledge that we are not harming the young or the queen, and therefore the future of our colony/hive. So to our first harvest! The top box, or honey super now had four ‘full’ frames of “capped honeycomb” also known as "capped frames" and two partials. 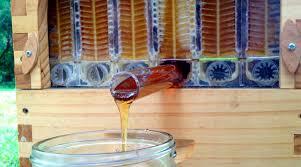 “Capped” refers to the bees covering the comb with wax once the cell is full. Therefore you want to harvest the capped frames. Now I doubted myself (given this was my first harvest) as some of the frames were not filled to the edges and some were thicker than others. This is where I wish I had had another set of hands with me to take photos- I had had the best of intentions in that respect, however this does become a sticky process. So between not wanting to aggravate the colony more than necessary and not wishing to sticky my phone, am afraid I can only try again next time… And in all honestly why I contemplated not writing this post. In all honesty the bees were rather accommodating (may have had something to do with me being more appropriately dressed- lesson learned). So I swiftly transferred the four full frames into an unused box- for easier transport. Then using a ‘hot knife’, following the frame as a guide. I opened the capped honey comb into a food grade container, placing each frame immediately into the extractor/spinner. I read a post that suggested capping one side at a time, so the honey wasn’t spun back on itself. I am not convinced this had any affect, but it did mean the frame wasn’t oozing as much when I uncapped the second side (given I had spun some of the honey out already. After quite some effort and spinning I did repeat the knife process a few times and eventually use a needle scraper to open some of the lower cells that the knife hadn’t reached. And spun some more. Once satisfied with my efforts, and if I am honest I wasn’t sure there was that much in the bottom of the extractor… and there was some still in the cells. I guess I left I shouldn’t be greedy and leave some for the bees. I returned the frames to the top box; leaving the honeycomb formation (and some honey) on them, ready for refilling. 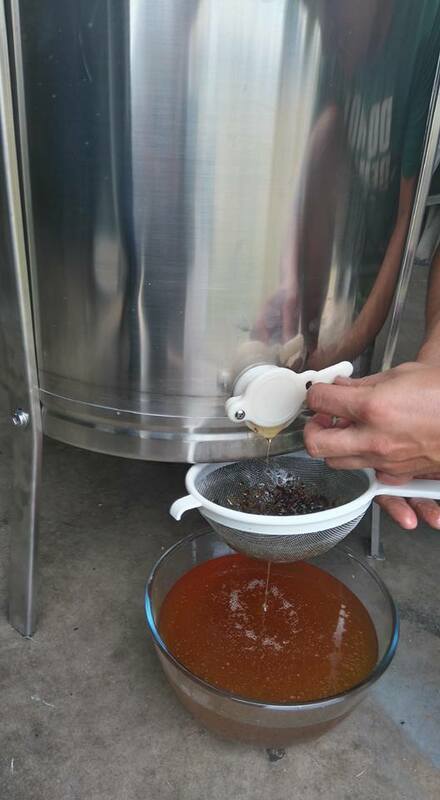 We then released the honey into food grade containers before filtering. 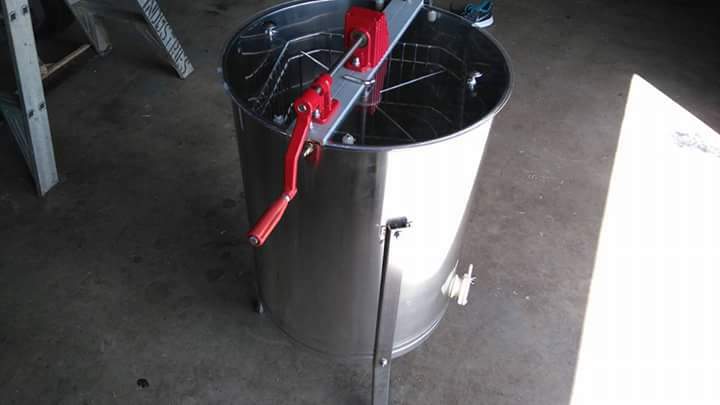 Now you can purchase honey vats with filters and taps. To transfer into and then bottle. 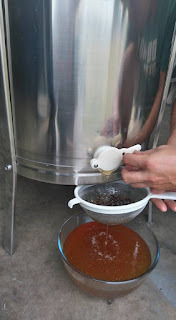 As We hadn’t quite got that far (and this is only for ourselves) We filtered the honey through paint strainer into a purpose bought stainless steel bucket. This was then siphoned into jars. This is considered raw, filtered honey. This actually produced around 6kg! 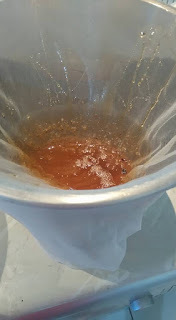 The honeycomb residue and honey mess collected in the food grade container during ‘uncapping’ we transferred to an oven dish (via a sieve- removing the largest particles) and heated until melted. This we removed, allowed to cool- separating the wax, as it floats to the top and sets and most of the other undesirable particles. Once lifted off and removed we then strained it as before, providing another kilo +. Only we used this honey to attempt Meade (honey wine), as it is 'heat treated' and often thought to be less suitable for consuming raw. General advise seems to be best for cooking... So will let you know how that goes in 6-12 months.